Snowmobile Trail Pass2014 Wisconsin Act 142, effective July 1, 2015, expanded the snowmobile trail pass requirement to include snowmobiles registered in Wisconsin and increased the nonresident snowmobile trail pass fee. 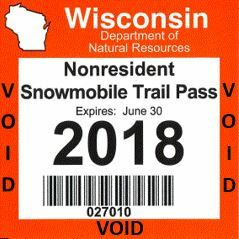 ​Beginning with the 2015-16 snow season, all snowmobiles operating on a Wisconsin snowmobile trail or corridor must display a valid snowmobile trail pass whether registered in Wisconsin or another state. Snowmobile Trail Pass2014 Wisconsin Act 142, effective July 1, 2015, expanded the snowmobile trail pass requirement to include snowmobiles registered in Wisconsin and increased the nonresident snowmobile trail pass fee. Beginning with the 2015-16 snow season, all snowmobiles operating on a Wisconsin snowmobile trail or corridor must display a valid snowmobile trail pass whether registered in Wisconsin or another state. a snowmobile owned by the U.S., another state or political subdivision thereof if the owner's name is displayed on the cowling. a snowmobile that is present in this state for a period not to exceed 15 days provided it is used exclusively as part of an advertisement being used for the manufacturer of the snowmobile. a snowmobile that is 35 years or older and displays antique registration. an annual pass valid until June 30 each year. a 3” x 3” decal required to be permanently affixed to the bottom center portion of the snowmobile windshield. not required to operate on private property, on a snow route, or on frozen water if not on a marked corridor. Snowmobile trail pass types, fees and how to orderThe snowmobile trail pass fee is dependent upon whether the snowmobile for which you are purchasing the trail pass is registered in Wisconsin and whether the owner of that snowmobile is a member of a snowmobile club and the Association of Wisconsin Snowmobile Clubs (AWSC). Trail pass fees are non-refundable. You will need your Wisconsin registration number or, for a nonresident snowmobile trail pass, the make and model. Wisconsin snowmobile trail pass for club members ($10) – for a snowmobile registered in Wisconsin and owned by a person who is both a member of a snowmobile club and a member of AWSC. Passes may be ordered through the AWSC website or their office in DeForest. Trail passes are delivered by US mail. A temporary trail use receipt is issued to operate legally on snowmobile trails. Carry the receipt with you until your pass is delivered by US mail and affixed to your snowmobile's windshield. Please visit www.awsc.org for more details. 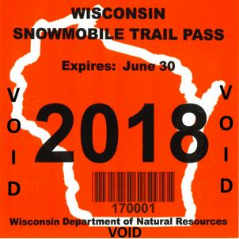 Wisconsin snowmobile trail pass ($30) – for a snowmobile registered in Wisconsin. Available online, or at any DNR sales agent. All Wisconsin snowmobile trail passes will be shipped by US Mail within 2 business days to the address specified. A temporary trail use receipt is issued to operate legally on snowmobile trails. Carry the receipt with you until your pass is delivered by the US mail and affixed to your snowmobile's windshield. Nonresident snowmobile trail pass ($50) – for a snowmobile registered in or in the process of being registered in another state, province or country. Available online, or at sales agent. All Wisconsin snowmobile trail passes will be shipped by US Mail within 2 business days to the address specified. A temporary trail use receipt is issued to operate legally on snowmobile trails. Carry the receipt with you until your pass is delivered by the U.S. Mail and affixed to your snowmobile’s windshield. Note: Snowmobile trail pass fees are non-refundable. The department will not honor refund requests if the snowmobile’s owner purchases a full priced snowmobile trail pass and later purchases a club member pass at the discounted rate. Yes the total for individuals is the same but please consider becoming a member as our club will get a portion of the fees to help us continue to develop and maintain our local trails! (don't have to be an active member) We always welcome volunteers but there is NO obligation to attend meetings or work on trails. We will not contact you for anything if you wish to be an inactive member. Your support by simply joining our membership roster is greatly appreciated! The revenue generated from the sale of snowmobile registrations and Wisconsin Trail Passes will go into the state snowmobile program’s segregated fund, which is used to pay snowmobile clubs for trail maintenance and development. CLUB VOLUNTEERS HAVE THE RESPONSIBILITY OF SECURING TRAIL EASEMENTS, PLACING NECESSARY SIGNAGE ON THE TRAILS, BRUSH, GROOM AND MAINTAIN TRAIL GROOMING EQUIPMENT. WITHOUT THE AWSC CLUB VOLUNTEERS, WISCONSIN'S SYSTEM WOULD NOT EXIST. BY BELONGING TO AN AWSC SNOWMOBILE CLUB, YOU ARE HELPING TO KEEP THE SPORT STRONG BY HAVING YOUR LEGISLATIVE VOICE HEARD AT THE CAPITOL IN MADISON AS WELL AS IN WASHINGTON, DC. IN ADDITION, YOUR MEMBERSHIP FEES ENABLE THE CLUBS TO CONTINUE TO IMPROVE THEIR TRAIL SYSTEM WHICH BENEFITS LOCAL ECONOMIES AS WELL AS WISCONSIN'S TOURISM ECONOMY.